#1. This week's number one is an experienced former international forward Amara Sy (202-81, agency: BeoBasket, currently plays in France). He was the major contributor in Monaco's victory against one of league's weakest teams Pau-Lacq-Orthez (7-27) 99-97 in the French ProA in Wednesday night's game. Sy recorded 16 points and grabbed 4 rebounds in 24 minutes on the court. AS Monaco Basket (25-9) is placed first in the ProA. Sy has relatively good stats this year: 11.1ppg, 3.3rpg, 1.3apg, 2FGP: 65.4%(89-136) and FT: 83.3% in 22 games he played so far. He has a dual citizenship: Mali and French. Sy played for the Mali senior national team seven years ago. #2. Second place goes to an international forward Cheick Soumaoro (204-90, currently plays in France). He led Saint-Quentin to a victory against the closely-ranked Vendee Challans (17-17) 85-76 in the French NM1 (third division) last Sunday. Soumaoro scored 17 points and grabbed 9 rebounds. Saint-Quentin Basket-Ball (24-10) is placed fourth in the NM1. 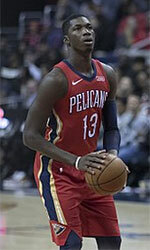 This season Soumaoro averages: 7.3ppg, 4.4rpg, 2FGP: 60.2%(50-83) and FT: 86.4%. He is in the roster of the Mali senior national team. #3. The Mali player who performed third best last week abroad was an international swingman Sourata Cisse (196-86, currently plays in France). Cisse could not help one of league's weakest teams Brissac Anjou (18-16) in their last game on Saturday. Despite his very good performance Brissac Anjou was defeated 103-94 on the road by the higher-ranked UB Chartres (#5). Cisse was the second best scorer with 22 points. He also added 4 rebounds and dished 6 assists. Cisse has individually a very good season with high stats. He averages: 16.9ppg, 2.7rpg, 3.0apg, 2FGP: 55.9%(128-229), 3FGP: 45.8%(76-166) and FT: 78.1%. Cisse is another player who holds two passports: Mali and French. Despite he played previously for the French U20 national team, Cisse is currently a member of the Mali senior national team. #4. Center Drissa Ballo (208-95, currently plays in France) was not able to help ADA Blois in their game against Provence Basket (24-10) in the French ProB (second division). He recorded 9 points, 4 rebounds and 2 blocks in 21 minutes. But the league leader ADA Blois lost 63-70 in Fos-sur-Mer to the lower-ranked (#4) Provence Basket. They ended the series of three consecutive victories. The Regular Season already ended. It's Ballo's first season with the team. This year Ballo's overall stats are: 3.7ppg and 2.8rpg in 33 games. He is also Mali national team player. #5. Former international guard Ludovic Chelle (183-83, currently plays in France) was not able to secure a victory for Caen (12-22) in their last game on Friday. Despite Chelle's good performance Caen was defeated 89-76 at home by the much higher-ranked Lille Metropole (#5). He recorded 10 points. The Regular Season already ended. Chelle's total stats this season are: 8.6ppg, 1.4rpg and 2.0apg. He has both Mali and French nationalities. Despite Chelle played previously for the French U20 national team, he is currently in the Mali national team roster. #6. Point guard Ibrahim Saounera (179-87, currently plays in France) faced previously mentioned Cheick Soumaoro in the French NM1 last game. Saounera couldn't help Vendee Challans (17-17) in their game against Saint-Quentin (24-10). He scored 9 points in 31 minutes. But Vendee Challans lost 76-85 on the opponent's court to the higher-ranked (#4) Saint-Quentin. It was Vendee Challans' third consecutive loss in a row. This year Saounera has relatively solid stats: 11.1ppg, 2.7rpg, 5.4apg and 1.2spg in 25 games. He is a former international player as he played for the Mali senior team three years ago. #7. International forward Mamadou Sy (196-85, college: Cloud County CC, currently plays in France) is a teammate of previously mentioned Sourata Cisse and both played together in the last French NM1 game. Sy couldn't help one of league's weakest teams Brissac Anjou (18-16) in their game against UB Chartres (23-11). He cannot count Saturday's game as one of the best ones. Sy scored only 3 points. Brissac Anjou was defeated 103-94 in Chartres by the higher-ranked UB Chartres (#5). Sy's total stats this season are: 4.4ppg, 4.3rpg and 1.9apg. He is also Mali national team player. #1. Bandja Sy (204-F-90, agency: BeoBasket, college: N.Mexico St., currently plays in Serbia) managed to help BC Partizan NiS Beograd in a victory against the third-ranked Mega Bemax (6-4) crushing them 97-68 in the Serbian KLS on Tuesday night. Sy recorded only 4 points and grabbed 6 rebounds in 22 minutes. It was the game of the round between two top 3 ranked teams in Group B. BC Partizan NiS Beograd (9-1) is placed second. It was his team's third consecutive victory in a row. This year Sy's overall stats are: 7.6ppg, 3.3rpg, 2.3apg and 1.5spg in 11 games he played so far. He has a dual citizenship: Mali and French. #2. 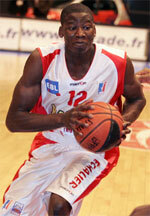 Ibrahima Sidibe (180-PG-95, currently plays in France). Sidibe could not help Caen (12-22) to beat Lille Metropole (23-11). He cannot count Friday's game as one of the best ones. Sidibe recorded only 2 points and had 3 steals in 10 minutes. Caen lost 76-89 at home to the much higher-ranked (#5) Lille Metropole. The Regular Season already ended. This year Sidibe's total stats are: 4.3ppg, 1.2rpg and 1.8apg in 31 games. He is another player who holds two passports: Mali and French.